Studies show that one-third of Americans say that the first thing they notice about a person is his or her smile. Therefore, when you grin, you want to make a positive impression. This is why cosmetic dentistry is so important – it provides an avenue to perfect your teeth. A specific route to smile perfection is through teeth whitening. But once you gain an aesthetically pleasing appearance, how do you maintain it? After all, you don’t want to enjoy amazing results only to lose them. So your Virginia Beach dentist will weigh in with tips on how to maintain your brilliant and bright new ivories. 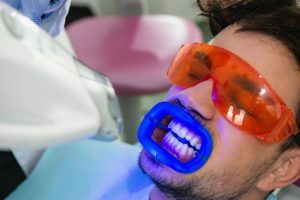 Professional teeth whitening using the ZOOM! method is a safe and effective means of enhancing your smile. Your dentist will apply a high-powered gel to your teeth and then use a laser to activate the bleaching agents. This acts to remove stubborn stains that have been embedded in your enamel. Safety – One of the dangers with teeth whitening is the possible exposure of your lips, gums and other soft tissues to the bleaching agents, which can irritate them. With the in-office treatment, though, your dentist will take special precautions to make sure that only your teeth are exposed to the whitening process. Results – In addition to being safe, you also want results. You’ll definitely get them with the ZOOM! whitening method. You can expect improvements of up to 10 shades brighter than your previous state. Limit Intake of Tannins – Tannins are natural coloring agents found in certain foods and drinks like curry, coffee and tea. They can majorly stain your teeth, so it’s best to limit your consumption of them. Say No to Tobacco – Not only is chewing or smoking tobacco bad for your health – it’s also horrible for the appearance of your teeth. The nicotine and tar leave behind stubborn residue. Rinsing – A good practice to adopt is to rinse your mouth after eating or drinking something that is known to stain your teeth, like berries or wine. Oral Hygiene – Along with rinsing your teeth, you should also be brushing and flossing after every meal. These are, of course, essential to your oral health but will also remove leftover particles before they can settle in and stain your teeth. The level of confidence that you experience when you have a beautiful smile is indescribable. When you take the steps above listed, you can maintain that euphoric feeling for a much longer time and ensure that every person you meet will be left with a positive impression. To schedule a consultation with your oral expert, just reach out today! Dr. Stephanie L. Santos earned her Doctor of Dental Surgery degree from Virginia Commonwealth University. After graduating, she completed her General Residency and has since gone on to deliver excellent care to every patient that enters her Smile by Design practice. Dr. Santos can be reached for information through her website.